As you might have guessed from the name of our humble little blog we’re old movie buffs. 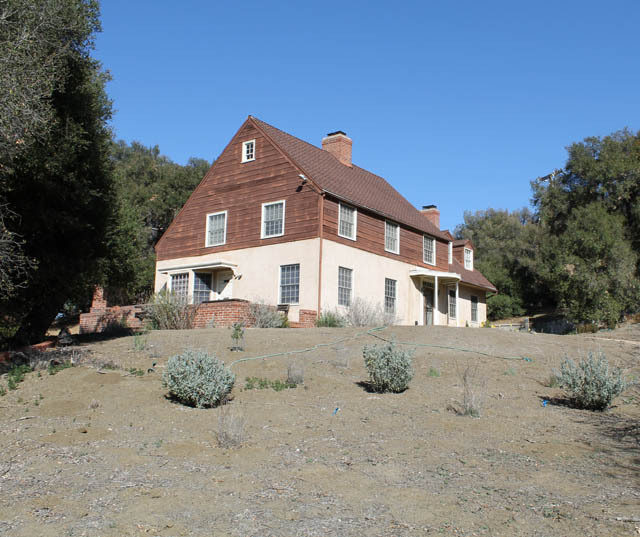 When we decided to name our blog after the 1948 film Mr. Blandings Builds His Dream House, paying homage to one of our favorite old Cary Grant screwball comedy, we had no idea that we would one day have the opportunity to see the very house that was used in the movie. And yet last weekend on a little jaunt to Los Angeles, we made a detour to Malibu and stood in the exact spot where Cary Grant and Myrna Loy had filmed over sixty years ago. 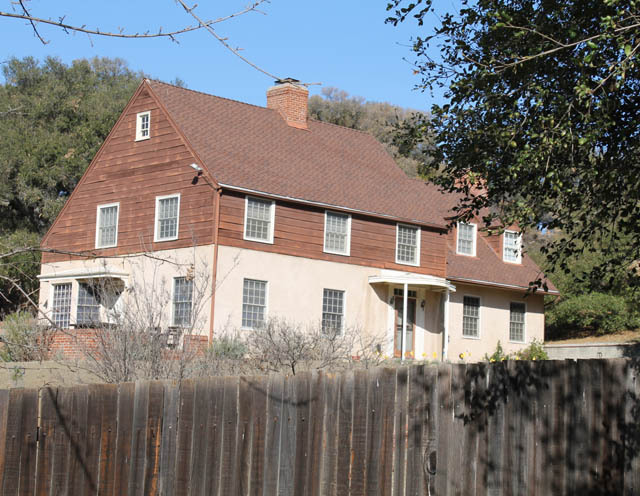 The house is still standing in the very spot where it was built for filming. 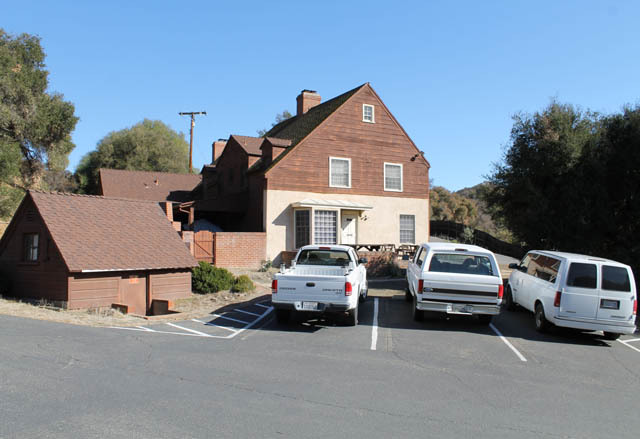 Now instead of being a on a back lot, however, the house is part of Malibu Creek State Park. 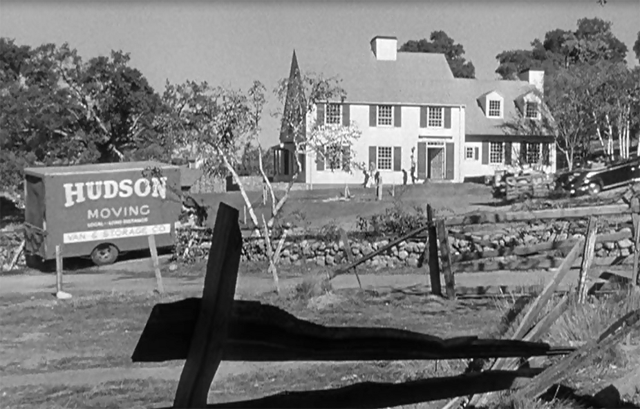 When we pulled up to the gate of the park in our rented Honda Civic, I sheepishly asked the park district employee if this was the location of the house that was used in the filming of Mr. Blandings Builds His Dream House. I was fully prepared to be met with a blank stare and maybe a “what the hell are you talking about?” Instead, he nodded. “You just want to see the outside of the house?” he asked. I thought he was asking this out of disbelief. Like, why in the world would you want to see the outside of some silly house? But actually he was asking because he wanted to know if we were just going to drive in, see the house and leave. “Yes, that’s right,” I said. The attendant waived the usual $15 entrance fee to the park, gave us a twenty minute grace period and told us to drive on in. We drove down a long lane, past hikers and campers and surrounded by beautiful mountain landscapes, until we came to a dead end. 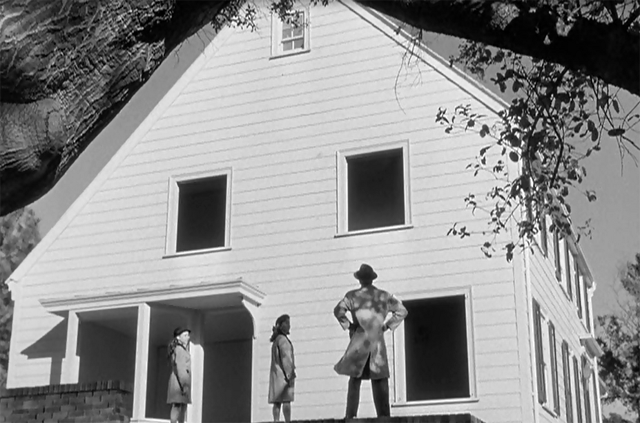 And there stood Mr. Blandings’ fictional dream house. As you can see, a lot has changed in the past 66 years. And yet there’s no denying that it’s the same house. Gone are the shutters and the consistent color scheme. Today the house features wood siding on the top half and a small portico has been added over the front porch. There are windows in the side of the house now, but the little covered porch on the side of the house is now a bay window. And instead of being surrounded by a manicured lawn, the house sits on a desert landscape. A few out buildings have also been added behind the house and the rock wall that once lined the front of the house has been replaced with a low red brick wall. It’s not as if we expected to drive up and find 1940’s era cars sitting in front of the house. And yet it was still jarring and kind of disappointing to see white pick-up park district vehicles parked in the asphalt parking lot. And yet after having seen the movie multiple times over the years, it was really fun to see this piece of cinematic history. I mean, how often do you get to stand in the exact spot where Cary Grant once stood? This entry was posted in dream house, Our Story and tagged california, malibu, mr. blandings, vacation on 02/24/2014 by Jason. There is a replica of this house that was done for the movie here in Terre Haute Indiana too. 2400 Ohio Boulevard. Oh thanks for the tip! I have family in Indiana. If we’re ever in the Terre Haute area, we’ll have to check it out. As it turns out, seventy three “replica” Dream Houses were built in 1948 to tie in with the promotion and release of the movie. Some were raffled off at the day of film release, after ticket sales held during public viewing prior to premiere, and others were put up for public sale by the contractors who built them. At least one was sold fully furnished by local suppliers. At least one took a couple of years to finally find a buyer, that being an apparently well-to-do Obstetrician who must have been making a wonderful living off of the Baby Boom which was well under way by then! Few were built exactly to spec with the movie house, since the only plans sent out by the producers to use as blueprints were simply plans of the incomplete movie set house, which had been built only so far as the movie required it to be seen. The contractors doing the building were left to fill in the blanks, and adjust them to local building codes, and regional “desires” for design. Most bore a strong resemblance to the original, but a few, like the one I read about built in Dallas, Tx, of course, were “Texas-sized” to 10 rooms and about 3,000 sq. ft! One of my favorite old comedies! LOVE that there is still the original and many “replicas”. Cary Grant’s best comedy EVER. I happen to have a list of all the cities where these replica “Blandings” homes were built. It’s printed in the July, 1948 issue of American Builder magazine, which I happen to collect. There is a list printed at the bottom of an advertising page. I think there’s about 60 listed, but it’s just cities, no street addresses. If anyone is interested, I’d be happy to copy the list into a message here. I’ll check back from time to time to see if anyone would like the list. There are, of course, a few states with multiple cities involved, like Texas, California, and even more than one in Indiana! Wow! That list sounds absolutely amazing. Please do post it! I live in a section of Sacramento CA called Hollywood Park, and there is a house here that my realtor told me was used in the filming. Obviously, it wasn’t but I wonder if it was one of the replicas. Is Sacramento on the list? Thanks! I’m a French Canadian from Laval, QC. and am a big old srewball comedies fan and this one also is one of my best. Thanks for taking the time to post all those wonderful informations and yes i would be interested in your list and thank you very very much for time and efforts. 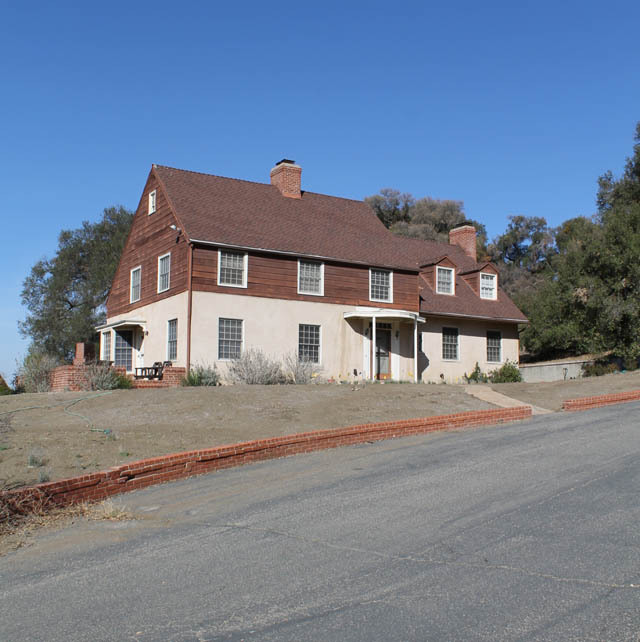 We live in the Blandings house in Bakersfield, CA and would love to have your list. If you would like a photo please advise. Oh how fun! We’d love to know more about your house! In Wikipedia you can see that 73 houses were made. Also follow the reference links. You’ll note that the house, ‘as built’ differed from the promotional plans published by the studio. For instance, the stair landing and access to the dining room and kitchen were built differently than the published plans (note the view through to the kitchen from the entrance hall in the film) – by the way, the bay window in the living room was an original feature – it was not a covered porch as you mention above. The roof was simply carried over to form a hood over the door. What I find interesting about the Blanding’s house, are the ‘as built’ changes, the built-in china niche in the Dining Room, for instance. 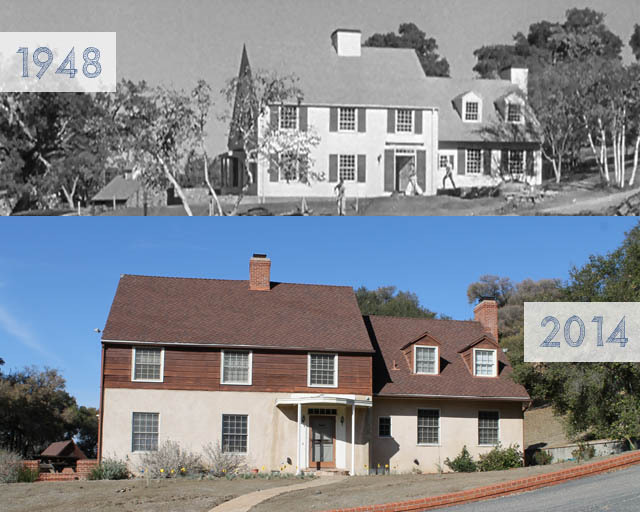 We get a glimpse of some of these changes in the film in several scenes: When Mr. Blanding walks to the rear of the house to discuss the missing windows with the architect and when the daughter drops the kitchenware on the back porch/terrace during Mrs. Blanding’s famous paint scheme scene. In each scene, the redesigned kitchen bump-out and den are visible. Here, you can see the exterior rear door has been re-located nearer the kitchen and a true porch with roof (and post) is shown. There is also a promotional photo showing Mr. and Mrs. Blanding sitting in the Den, there you can see an interior door to the kitchen nestled between two built-in bookcases (see promotional plans). This photo clearly indicates that the adjoining room (kitchen) is one-step higher than the Den. In yet another scene, we get a glimpse of the Den from the living room showing another ‘as built’ change – the Den, appears to be on higher level than the Living Room. The floor height change is visible and there is a railing, similar to that near the Dining Room access/stair landing. This railing forms the armrest of a window seat below the Den windows. Also, the ‘as built’ home shows a roof line different than that of the promotional plans. The rear roof line over the living room seems to be lower than the front roof line, whereas the published plans show these as equal. This would allow for a larger living room and avoids having the side terrace door from being placed on-center to the living room fireplace. My grandfather built a home in 1942 in a similar style, albeit much smaller. Interestingly, this house and many like it in the neighborhood lacked protection over the front door – just like the Blanding’s house. Odd, considering we lived in an area that receives snow, as well as rain. This home may be small by today’s over-inflated standards, but what that generation of designers considered to be minimum standards certainly lack in contemporary homes. Take, for instance the dual-exposure in almost all rooms, providing cross-ventilation, as well as abundant light, which was guaranteed by axial views that allowed for long vistas and the ability to draw the available natural light deep into a space. The placement of the windows in this house, in particular, eliminates ‘dark’ corners quite well. This house, with its simple lines and no-nonsense attitude, lives well. I’d take it – how about you? The house was designed by Baltimore architect E. Russell Marcks and one of the promotional houses still exists at 7111 Bellona Avenue in Baltimore. As a Real Estate Broker, your correct this is an excellent and functional plan. My favorite designer Jim Wells of Atlanta Plan Source has strikingly similiar plans that are economical and have absolutely no wasted space. As far as the bay window, in the picture posted here, with the movie’s stars you can upon closer examination see that it was the framework for a bay window. The windows had not been installed, as was the case of all windows on the that side of the house, except for the attic window. If anyone has a street address of all the homes that would be cool. An heir to the Fulton fortune in Knoxville, TN was said to have,”downsized” from her palatial mansion to a replica home. I am curious if it that one was in Knoxville. Thanks GREAT Post! The Knoxville Blandings house is located at 3559 Iskagna Dr SW. When I was researching it I contacted a Ruth Fulton Tiedemann, her Aunt Barbara moved to the Blandings house after she left the estate. I will ad a newspaper ad for the Knoxville house when I get a chance. Feel free to contact me at ericesveda@comcast.net. I’d like to know if the house still stands after the latest fires that destroyed some of the park.